rec. Chapel of Merton College, 2008. DDD. This new recording was made available to download several weeks in advance of its issue on CD, due on 2 March 2009. I’ve already reviewed that download in my February 2009, Download Roundup, where I made it joint Download of the Month with the Chandos Purcell Dido and Æneas. This is the promised more detailed review: as I downloaded the CD-quality version complete with the booklet and inserts you may take what I am reporting on to be the equivalent of the finished disc. On past experience, their 320k mp3 downloads are pretty good, too. Nor do I see any reason to modify the accolade which I awarded to the download: this is a very worthy Recording of the Month. If you don’t want to take my word for it, avail yourself of the free track download for a limited time from Gimell. Peter Phillips’ notes for the new recording are also available there – no purchase necessary – in English, French and German. 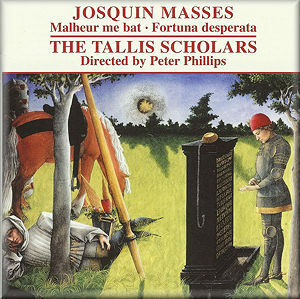 The Tallis Scholars have had plenty of practice with Josquin, whom Peter Phillips rightly hails as the superstar amongst renaissance composers. He delivers that judgement in the booklet which comes with one of their earlier recordings of Josquin, incredible value on a 2-for-1 issue The Tallis Scholars Sing Josquin (CDGIM206) – Missa pange lingua, Missa la sol fa re mi and the two masses based on L’homme armé (Missa ... super voces musicales and Missa ... sexti toni). Even if you have the Oxford Camerata’s very good performance of these (8.553428) you need the Gimell set, which also replaces decent performances of Missa pange lingua (Ensemble Organum/Marcel Pérès, recently reissued on Harmonia Mundi Gold HMG50 1239) and Missa la sol fa re mi (Capella Antiqua/Konrad Ruhland, BMG71966, no longer available) in my collection. Both works benefit from the slower pace of The Tallis Scholars. I haven’t heard the well-received Hyperion recording of Missa pange lingua (CDA66614, Westminster Cathedral), now available from their Archive service only, on which James O’Donnell’s tempi are marginally slower even than those of the Tallis Scholars. With a total playing time of almost two-and-a-half hours, this reissue of recordings dating from 1986, 1989 and 1994 is just too good to pass by and can be confidently recommended along with their other bargain twofers: Requiem (CDGIM205), Christmas with the Tallis Scholars (CDGIM202 – see review), Tudor Church Music (CDGIM209 and 210 – see review), Palestrina (CDGIM204), Tallis (CDGIM203 – see review) and Byrd (CDGIM208 – see review). The existence of these inexpensive 2-CD collections is the only small obstacle in the way of my recommending the new CD unreservedly – they are just such good value that, if you don’t have any of them, even if you have other good recordings of these composers, such as Chapelle du Roi’s complete Tallis (Signum), they should be your first port of call. I warn you however, that if you don’t yet know Josquin’s music and purchase CDGIM206, you’ll also want the new CD and last year’s issue of Missa sine nomine and Missa ad fugam (CDGIM039 – see Robert Hugill’s review and my own review of this essential purchase for all lovers of polyphony). The new performances engender the same sense of unhurried timelessness that is to be found on their earlier Josquin recordings. The cover picture chosen for CDGIM206 is just right, though it antedates Josquin’s music by some 70 years – Rogier van der Weyden’s The Magdalen Reading in the London National Gallery. This is not the wildly penitent Mary Magdalen often depicted in poetry and painting but a serene and beautiful contemplative, painted in loving detail. Whether by coincidence or not – probably not, having twice discussed the suitability of cover paintings with Steve Smith of Gimell – the names of both Josquin and Rogier mean ‘of the meadow(s)’ – the latter was also known as Rogelet de la Pasture – though none quite rivals the wonderful name of the medieval poet Walther von der Vogelweide, ‘Walter of the bird-meadow’. The cover of the new CD is equally indicative of the quality of The Tallis Scholars’ singing in this music. Taken from the illustrations in King René’s Livre du Cueur d’Amours Espris in the Austrian National Library (Cod.2597, fol. 15r), it depicts the peaceful contemplation of the fountain which in the previous episode wrought havoc – when the knight poured the water from the drinking vessel onto the fountain, it provoked a cataclysmic storm. The episode, if not exactly archetypal, is borrowed from Yvain, le Chevalier au Lion, by the progenitor of courtly love poetry, Chrétien de Troyes. Josquin’s music, too, represents a calm in which the earlier storm of the secular chanson is still recalled. As with the L’homme armé masses Josquin sublimates the significance of the secular work into the timeless words of the mass – words which not even the coming reformation would change greatly, at least in Lutheran and Anglican usage – ‘while at the same time expressing the essential nature of the texts and driving the musical argument forward’ as Phillips puts it in his excellent notes. [Desperate fortune, wicked and cursed, you have blackened the reputation of such a marvellous lady]. Several composers made settings of the words, including Josquin’s near-contemporary Agricola: a very well received collection of his music on Naxos not only includes his setting but employs it as the title of the programme (Unicorn Ensemble/Michael Posch, 8.553840). There is a three-part instrumental version, attributed by some to Josquin, and some thirty masses which employ the tune as their cantus firmus, including one by Obrecht. As none of these is currently available – though there used to be a recording of the Obrecht by the Clemencic Consort – I am happy to accept the word of musical historians that Josquin’s is the most skilful. It’s certainly a beautiful (early?) work and I’m very pleased that the Tallis Scholars have given us this excellent performance by which to enjoy it. An earlier recording, coupled with settings of the chanson itself, seems to have been deleted (ASV CDGAU220 – see review). The same is equally true of the other mass, which employs Ockeghem’s (or Malcort’s) Malheur me bat. The words of this chanson are lost but were, no doubt, equally eloquent on the subject of love’s misfortunes. As always, the Gimell notes are scholarly yet accessible. Bought with the CD or downloaded as a pdf. file, the whole presentation maintains the high quality of the series and perfectly complements the high quality of the performance and recording. Phillips demonstrates how Josquin borrows from all three vocal parts of the chanson Fortuna desperata and even offers a convincing analysis of Josquin’s thought process in both works. Thankfully, The Tallis Scholars and their principal rivals, Harry Christophers and The Sixteen, don’t compete in Josquin – the latter have only two short Josquin pieces in their current recorded repertoire, so I’m spared a difficult decision. Where they do compete in later renaissance repertoire, I usually find it almost impossibly difficult to decide between The Sixteen’s usually more energetic performances and The Tallis Scholars’ generally more contemplative approach to the music: both almost invariably produce thoroughly convincing and musical interpretations. The Tallis Scholars and The Sixteen are not the only players in the increasingly competitive Premier League of renaissance music. I’ve recently been very impressed by the Brabant Ensemble in Morales (Hyperion CDA67694 – see review) and by the Binchois Consort’s recording of Dufay’s Missa Se la face ay pale, set in liturgical context (Hyperion CDA67715 – see review) and, earlier, by Diabolus in Musica’s interpretation of the Dufay, again in context (Alpha 051). The Binchois Consort also recorded a first-class collection of shorter works by Josquin and his contemporaries (CDA67183), but I think the new Gimell recording would have a slight priority, even in the exalted company mentioned in this paragraph, if I had to ration myself. If you don’t have to ration yourself, I can promise that none of the Gimell, Hyperion or Alpha recordings discussed in this review will disappoint.